LONDON, England (CNN) -- Nigeria's huge film industry, Nollywood, may have overtaken Hollywood as the world's second largest producer of films, but piracy is threatening to cut off the industry in its prime. 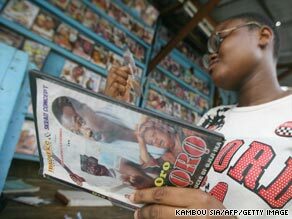 Nollywood's cheaply-made, video-format movies are wildly popular across Africa. Nollywood insiders estimate that up to 50 percent of the industry's profits are currently being lost to Nigeria's endemic piracy and corruption problems. "Piracy has dealt a big blow to the industry," Emmanuel Isikaku, a Nollywood producer of 13 years and president of the Film & Video Producers and Marketers Association of Nigeria told CNN. Isikaku, 42, claims he lost so much money on his 2007 movie "Plane Crash" through piracy that he failed to recover his costs, despite the film's popularity with audiences. "I couldn't make anything from it," Isikaku told CNN. "Because of piracy I didn't even break even. "A lot of people watched the film, but unfortunately they watched pirated copies," he said. Nigeria's huge, mostly unregulated film industry is based in Lagos, the sprawling, frenetic financial capital of west Africa's largest country. Made with a spirit of grassroots entrepreneurship, Nollywood's video-format B movies are vibrant and inventive, fusing traditional voodoo and magic with urban romance stories. They are films that speak about modern life from an African perspective, driven by a narrative that is strongly rooted in the African oral storytelling tradition. Nollywood films are wildly popular across the continent and with the African diaspora all over the world. Nollywood recently overtook Hollywood as the world's second biggest producer of movies behind India's Bollywood. In 2006 it produced 872 movies compared with 485 major feature films in the U.S. (although for a fraction of the cost), according to a global cinema survey conducted by the UNESCO Institute for Statistics (UIS). Hollywood has started tapping into Nollywood's global popularity: Earlier this year, "Close Enemies," the first crossover film, was produced in LA by Prince Ade Bamiro using major Nollywood stars. It was made for $300,000 -- about 10 times the average Nollywood budget -- and was screened in the Nigerian Pavilion at Cannes. But improvements in piracy technology are making the problem more acute, draining Nollywood's coffers and confidence and stopping the industry from making the improvements in quality it needs to cross over into the global mainstream. Nigeria's independent producers self-fund hundreds of movies each year. The average budget is around N3.5 million ($25,000). They make their money back by selling DVDs of their movies, which they burn themselves, on stalls in markets or in shops. While Nigerians are wild about watching films, Nigeria has virtually no formal cinemas with 99 percent of screenings using DVDs held in informal settings, according to UNESCO. Producers have only one distribution route compared with, for example, Hollywood where studios recoup production costs through cinematic exhibition -- an arena currently safe from piracy -- and make a profit from DVD sales and TV rights. Most pirated movies are a victim of their own success: Pirates take the fastest-selling DVDs to China to be mass-produced and bring them back to Africa to sell. According to Isikaku, piracy was eating into his profits back in 2005, when he estimates he lost N10,000,000 ($68,000) because of illegally copied DVDs. But, he says, the problem became "alarming" in 2007 when pirates started to use video compression technology. Video compression digital technology allows from five to 20 films (both Nollywood and Hollywood) to be squeezed onto one disk and then sold for around N590 ($4). When a legitimate Nollywood DVD is sold for the equivalent of $7 to $10, it's hard for producers to compete. "This new development in piracy has the potential to kill the industry off completely," Dr. Sylvester Ogbechie, President of the LA-based Nollywood Foundation told CNN. Although no official figures exist, Ogbechie estimates from his conversations with some of the industry's top producers that up to 50 percent of profits are currently being lost to piracy. Isikaku claims the problem is so endemic in Nigerian culture that some cable TV channels will air Nollywood movies without the permission of the producer, or that if they do pay, they pay "peanuts." "And the moment people are watching on TV, they are discouraged from buying DVDs at the market," he said. All this has had a knock-on effect on the confidence of the industry. "You think twice before you invest in film productions now," says Isikaku. "Investors are being discouraged." This feeling is endemic, and producers are trying to bring down production costs: "The quality of our productions is going down every day," he explained. This is a blow to an industry known for low production values and whose practitioners are mostly self-taught. Criticisms of the industry's films include poor sound quality, inadequate lighting, ill thought-out camera angles and the repetitive nature of many of its storylines. Insiders know that improving the quality of their films is crucial if their young industry is to make the leap into the global mainstream. They say Nigerian government must tighten up border controls and seize pirated DVDs as they re-enter the country from China. "Some of these movies come in through our airports, our ports," says Isikaku. "Much depends on the government agencies." Hope may come from the direction of Nigeria's National Film & Video Censors Board led by Director-General Emeka Mba, who is making moves to restructure and formalize the industry. "There has to be some process of formalizing the industry -- giving the industry depth and that's where the government can come in through regulation, through incentives and create that process of empowerment for the industry," Mba told CNN. "Hundreds of thousands of Nigerians are in this industry, especially young men and women." Despite the setbacks, Isikaku also remains hopeful for the industry. "Pirates have stopped us working hard because we don't get what we are due but all hope is not last because we are passionate. "Nollywood can come together to take action to help this industry to survive," he said.